A very auspicious month according to the ancient scriptures, Shravan Maas falls somewhere during July to August. Shravana Nakshatra is the birthstar of Vishnu and falls on the full moon day during this time. So, this month is called "Shravan Maas." Each day of this month is a very auspicious time to worship many deities, including Lord Shiva, Gowri, Krishna, and Goddess Lakshmi. Special prayers and rituals are performed in Shiva temples. Mondays (Somavar) of Shravan month are specially observed times to worship the austere Lord Shiva with austerity. During the entire month of Shravan Maas, visiting the Shiva Temple in the evening and offering flowers and abhishekam gives a long and prosperous life. The Rudrabhishekam is the primary way to worship Lord Shiva. It is well-known that Lord Shiva is an abhishekapriya (lover of ablutions). In this puja, Lord Shiva is worshipped in his Rudra form. It is hailed in all Vedic scriptures as one of the greatest pujas to remove all evils, to attain all desires, and for all around prosperity. This puja is performed for the sake of washing away one’s sins and afflictions. It brings peace, prosperity, happiness, and family togetherness. Performing this puja for Lord Shiva is an excellent remedy for anything not in harmony with Nature (doshas), and for all-around success in all areas of life. 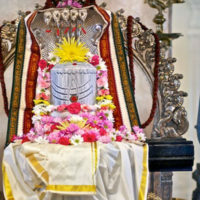 In the Shravan month, the Shiva linga should be worshipped with water, milk, curd (yogurt), sugar, ghee, honey, flowers, and especially bilwa leaves. During Shravan Maas, Rudrabhishekam is performed at pradosham (sunset) to worship Lord Shiva as he performs the holy dance in Kailasam. All devatas assemble there to watch this holy event, and offer their prayers to him. According to the Vedas and ancient scriptures, thinking and meditating during pradosham (sunset) time is considered most sacred. The one who worships Lord Shiva at pradosham will get the benefits of having worshipped all devatas at one time. 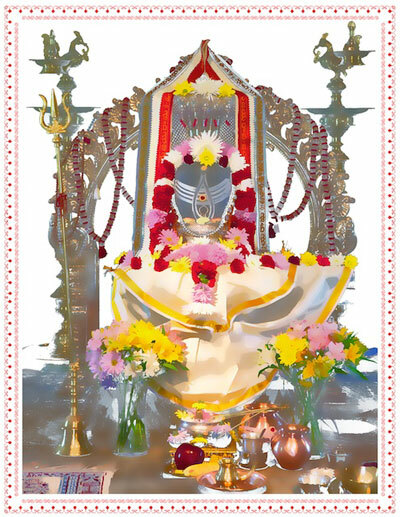 This is the most important among the pujas performed to the graceful Lord Shiva. Shravan Shanivar is an auspicious day to worship Lord Shani (Saturn). According to the Puranas, Lord Shani (Saturn) gave a boon to Dasarath (Lord Rama’s father) that those who worship Lord Shani on Shravan Shanivar (Saturdays in the month of Shravan Maas) will not be affected by Saturn. Also, Lord Shani will bless the people who are affected by Sade Sathe and Shani dasa. Fasting during Shravan Maas is highly auspicious, and it is recommended that no one consume food until after the evening puja on Mondays. Upavaas (Upa = nearby, vaas = to live or stay) means we need to be near God, resting into our own divinity, while chanting mantras, visiting the Temple, or doing such holy activities. Attain the virtues received by visiting the twelve Jyothirlingas. Minimize the effects of an afflicted moon. Somvar Vrath begins at sunrise on Monday. Usually those devotees observing the Vrath, visit a Lord Shiva Temple in the morning and the evening. 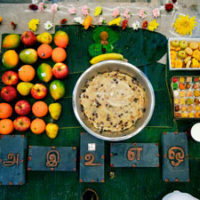 After attending the evening Rudrabhishekam, people break the fast and eat a light supper. Those who cannot fast (children, elders, and sick people) can do a partial fast that includes a single meal taken after noon (no breakfast). They can also eat fruit or sabudana (tapioca dish) and visit the Lord Shiva Temple.